Our match today takes place in the old-school world of WWII Shoot them Up: it takes place between an instant classic from Capcom, 1941 Counter Attack, and its contemporary lesser-known Ghost Pilots. But better not underestimate this outsider, as it takes place on the almighty Neo Geo. What differenciates the two games at first, is the display mode. 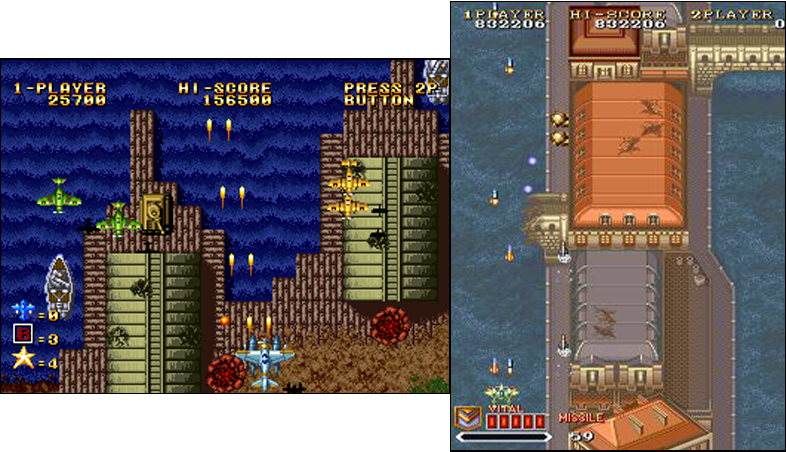 Whereas 1941 uses a vertical (tate) screen, the SNK title uses a standard 4/3 screen (yoko), offering a wide view but a limited visual field. It's a simple matter of taste whether you like one or the other, because both games are going to defend themselves with their own intrinsic qualities. 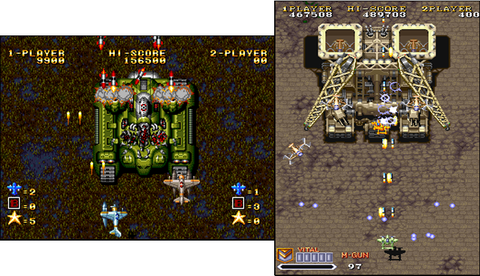 SNK game is bigger, with 55 megs against 20, and the Neo Geo is more powerful than the CPS on almost all points. Will it help Ghost Pilots take advantage over 1941 Counter Attack? 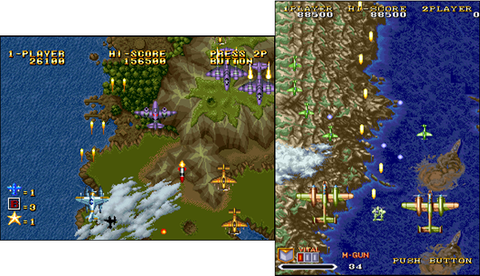 The backgrounds are pretty much the same from one game to another: air and naval bases, forests, oceans and islands, cities, cloudy skies ... and it is clear that Ghost Pilots takes the advantage on this chapter. The views are more varied, have more dept, and are also more detailed. 1941 is going especially over oceans and clouds, but the view is more distant and so less detailed. This is not bad, but far too simplistic to match the title of SNK, which makes much better with its graphics. 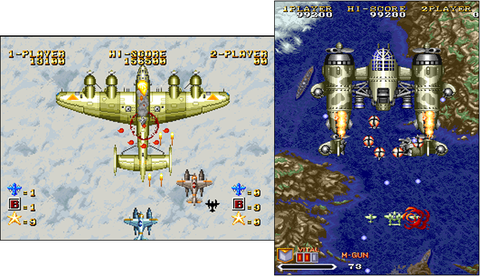 Where Ghost Pilots opposes the bare minimum and slow aircrafts, the title of Capcom shows full of life! Animated clouds, storming seas, fast enemies, player's ship moving and firing quickly... It's punchy at will, and as we shall see below, contributes to an excellent gameplay. 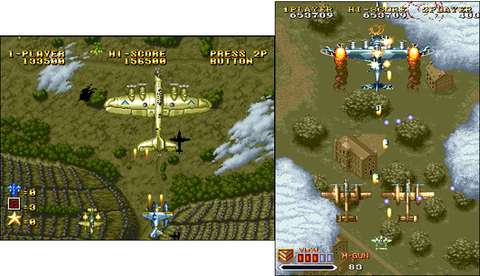 SNK could have done better, as Ghost Pilots is slow and stiff with the airplanes animation, and more static with the backgrounds. Some zooms and effects punctuate the beautifully crafted backgrounds, while fighting against bosses in particular. The scrollings of 1941 are more varied in speed and overall faster too. As for the global decomposition, both titles are at par, and about slowdowns, there's not any to report for Ghost Pilots, and extremely rare ones in 1941. A chapter where the megas speak, once more. The difference in sound quality arises. The discrete melodies fit well the action in Ghost Pilots, accompanied by successful sound effects. Without reaching heights of originality, the quality is still high for a 1990 game, while the CPS has never been a benchmark for its audio performances. It sizzles, analog sounds are bland and effects rather simplistic... However, as for the game's animation, the themes are dynamic and catchy enough, which is a very good point. It's more speedy than Ghost Pilots, but overall a good notch below on sampling quality, sound effects or music. Our rivals feature cooperative play, a good point for both. Speaking about the difficulty, SNK's game scoops the gold medal, hands down. 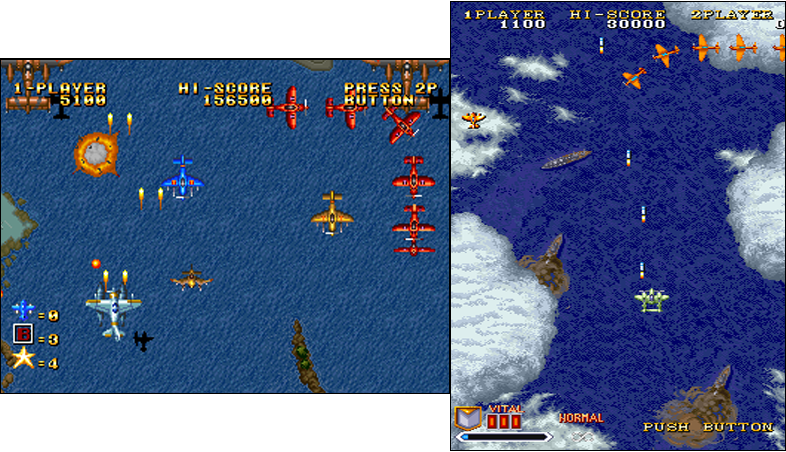 This is due largely to the very structure of the game: the planes we control are larger, slower and have less bonus protection and fewer weapons than in 1941. In this one, your plane can be hit several times before you lose all bonuses and die. In Ghost Pilots, a single impact and the aircraft is destroyed, putting all bonuses granted away... it's hard! GP is also longer and packs more varied stages: it takes about one hour to clear the game, but if you aim for the one-credit clear, you'd better be a great player! 1941 offers a more measured, shorter challenge: less than thirty minutes to finish, knowing that with a little practice, it can be done within very few credits. 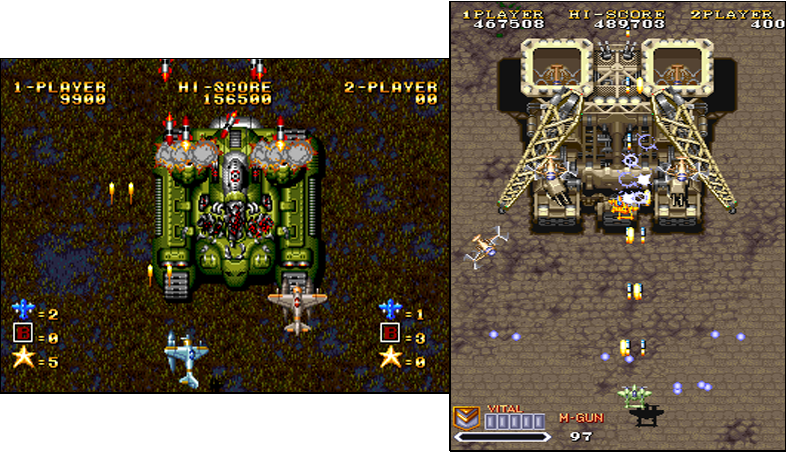 If it's more off-putting because of its difficulty, Ghost Pilots largely wins this round, thanks to a life almost twice as long... As for pure replay value, that's another story! 1941 takes the advantage. As we've seen for the animation, Capcom's soft is more speed. The planes are smaller and more mobile than in Ghost Pilots. We can load the firing bar, get bonuses and super-attacks, collect shields and additional planes... game also features a health bar, ie you don't die instantly with enemy impacts. Extra lives are granted for the points scored in each game, but we have to recognize that Counter Attack is more complete on many points. Ghost Pilots demand a hell of a great mastery and tremendous anticipation! The enemies are often faster than the player's ship, and maintaining a strong weapon (thanks to the hardly collected bonus) is a challenge, since when you reach the fourth stages, it becomes hard not to die every two minutes. A strong challenge , certainly, but Capcom's 1941 takes advantage with more fun and smarter mechanics. Finally, although it's shorter and graphically less impressive, players might love 1941 Counter Attack better than its rival. The gameplay makes the difference, there's no doubt about it here. More nervous, more fun, the game also offers a way more fair challenge than Ghost Pilots, which definitely sets the level too high. Only a few experienced players might prefer this longer and harder game, but a vast majority of gamers will enjoy better 1941. Despite its slightly better realization, Ghost Pilots must admit a defeat. The dynamism, pace and gameplay of its competitor are making a difference... and have it winning this duel!